For use ONLY on the NATURALLY ASPIRATED 11.0:1 Compression Ratio Ford Racing 5.0L Aluminator Crate Engine -- manual transmissions. 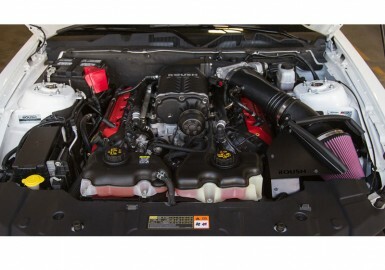 Please contact our sales team if you are unsure what type of engine you have. 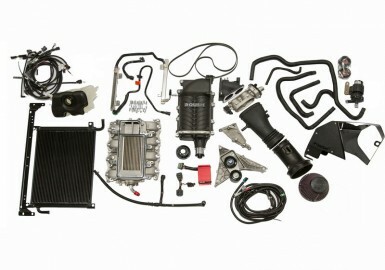 Is your vehicle powered by the Naturally Aspirated 11.0:1 Ford Racing 5.0L DOHC Aluminator Crate Engine? Are you looking to get more power out of it? 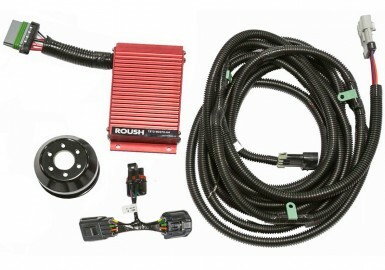 If so, check out the ROUSH Phase 3 Supercharger Kit "Aluminator" edition. This kit will deliver 675 HP and 585 FT/LB of torque, that’s an increase of 255 HP and 195 FT/LB over the stock Aluminator engine. The Phase 3 Supercharger Kit "Aluminator" edition has been specifically calibrated for those who have the 5.0L Aluminator NA 11.0:1 Compression Ratio Crate engine already installed in their 2011-2014 Mustang GT. This kit is part of the TVS (Twin Vortices Series) line of superchargers, developed by ROUSH, that have raised the bar for performance, reliability and efficiency. This is the same line that has been used and proven for years in ROUSH-built vehicles. The ROUSH R2300 supercharger features Eaton's TVS technology rotating assembly that delivers more power and better fuel economy in a smaller package for uncompromising performance. With this much horsepower under the hood, ROUSH Performance went one step further to ensure that the fuel delivery system can meet the increased fuel needs. A Fuel Pump Voltage Regulator and an easy to install Plug-n-Play wiring harness were developed to help protect against extreme fuel-to-air changes and possible engine damage. This kit is protected by ROUSH Parts limited warranty (ROUSH Supplied Parts Only), which is for 3 years or 36,000 miles from original installation date. The 5.0 Aluminator NA was designed specifically for high performance applications -- now is the time to add the power! 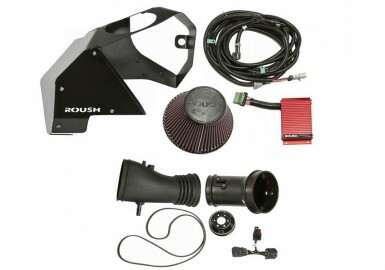 The 2011-2014 Ford Mustang GT Supercharger - ROUSH Phase 3 - 675 HP Calibrated Kit is protected by ROUSH Parts limited warranty (ROUSH Supplied Parts Only), which is for 3 years or 36,000 miles from original installation date.